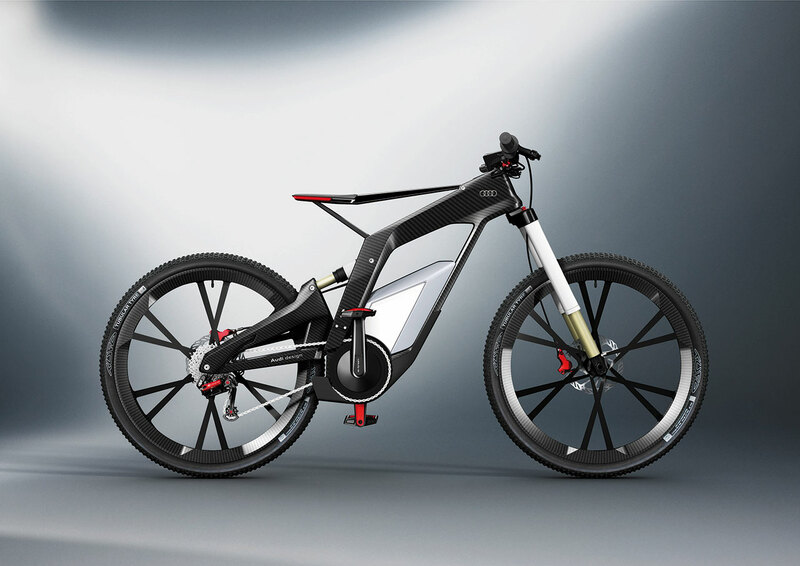 On May 16, Audi presented an extremely emotion-inspiring sports machine, the Audi e-bike Wörthersee – at Wörthersee in Carinthia, Austria. The prototype cycle combines an electric drive and muscle power. 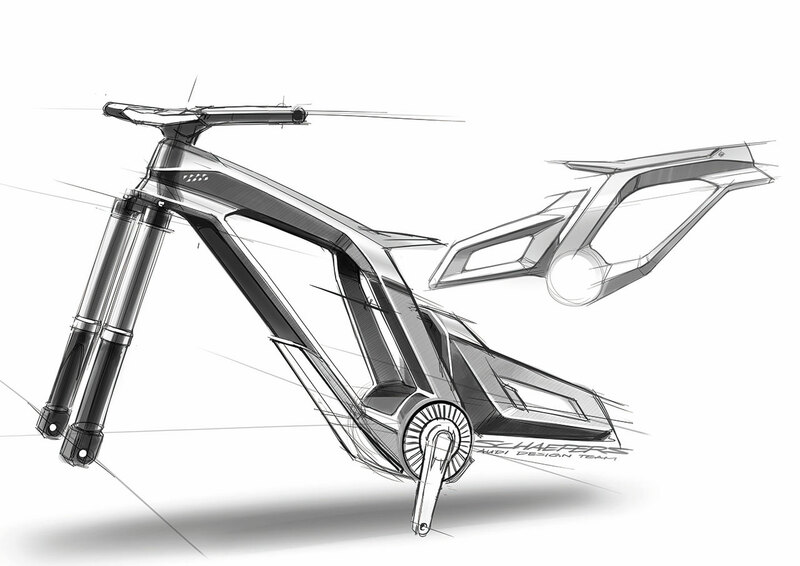 Head of Design Wolfgang Egger comments: “As a high-performance e-bike for sports and trick cycling, it features the Audi core competences of design, ultra, e-tron and connect.” The Audi e-bike Wörthersee puts in its first major appearance at this year’s Wörthersee Tour, the 31st meet for Audi, VW, Seat and Skoda fans; trial biker Julien Dupont and downhill specialist Petra Bernhard will demonstrate their stunts and streetbike skills. The airy frame boasts a low center of gravity and a compact overall volume. In this way, the e-bike is superbly agile at the sporty handling limits. The lithium-ion battery is incorporated into the frame and needs 2.5 hours to fully charge. On long trial tours, only a few simple steps are required to remove the battery and replace it with a charged one. The frame and the swinging arm that holds the back wheel are made of carbon fiber- reinforced polymer (CFRP). The same material is used for the 26” wheels, which feature an innovative “Audi ultra blade” design with broad flat spokes for an optimized transmission of pedal power. “We were able to demonstrate with the choice of materials just how closely design goes hand in hand with expertise in ultra lightweight construction,” Hendrik Schaefers comments. Homogeneous LED light strips round out the frame and create the immediately recognizable Audi light signature. For extreme tricks and stunts the seat can be lowered to run flush with the frame itself. At the press of a button, the seat then rises up and the biker can adopt a comfortable position. Cycling modes and countless other functions can be set using the touchscreen on-bike computer. The cyclist’s smartphone hooks up by WLAN to the computer – when you start cycling, for example, the immobilizer is deactivated. Video images of the trial drive or of a trick, as recorded via the in-helmet camera, are uploaded to the Internet in real time via your smartphone. Each trick performed successfully is then awarded success points, and as the number of points awarded grows, the cyclist receives awards and the challenge level rises, too. The rankings table in the Internet means you can measure yourself against other bikers and your friends. And where they happen to be comes to you via Facebook status reports that pop up on the Audi e-bike Wörthersee display. The cyclist can choose between a total of five cycling modes – pure muscle power, the electric motor alone, or pedaling supported by the electric motor. In the “Pure” mode, the drive power is purely the product of the cyclist’s legs, while in “Pedelec” mode you are supported by the electric motor that then makes speeds of up to 80 km/h (50 mph) possible and gives you a range of 50-70 kilometers (31-44 miles). 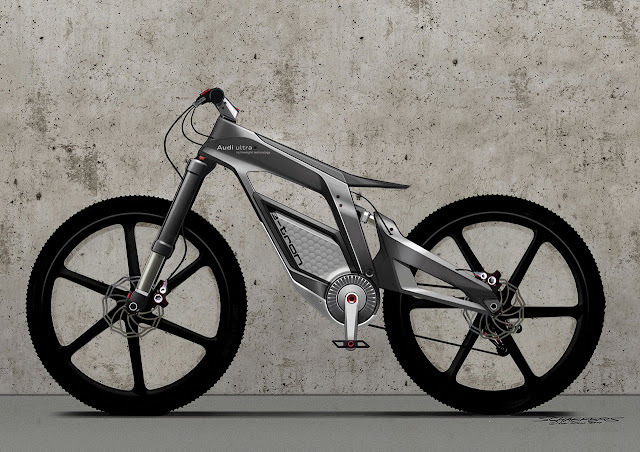 If you select “eGrip”, the Audi e-bike Wörthersee runs solely on the electric motor and can reach a top speed of 50 km/h (31 mph). The cyclist then controls forward momentum using a gripshift and can configure the power as desired using the computer. When performing wheelies, an electronic control system support the rider when performing tricks and back-wheel biking. Different modes can be set using a smartphone or directly on the e-bike – either “Power Wheelie” mode, with adjustable wheelie angle for less skilled bikers or “Balanced Wheelie” mode for sporting challenges. In “Balanced Wheelie” mode, the electronic control system maintains the rider’s balance, by compensating the biker’s movements forwards or backwards via the electric motor. This means the rider can influence the bike’s speed by shifting weight: if you lean forwards the bike picks up speed, and if you lean back it slows. You select “Training” mode if you want to keep your performance constant for training purposes. The electric motor is located at the lowest point on the frame and drives the bottom bracket shaft directly. The maximum torque delivered to the rear wheel is 250 Nm (184.39 lb-ft). 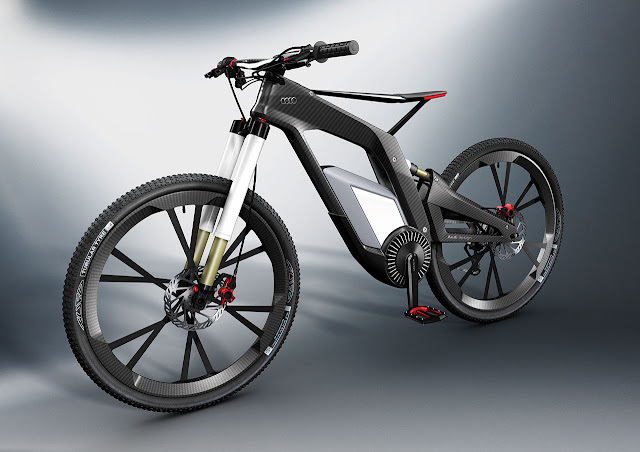 The electric motor generates a maximum output of 2.3 kW, a new world best for e-bikes. The complete bike excluding electrical components weighs in at 11 kg (24.25 lb), equivalent to a power-to-weight ratio of 9 kg (19.84 lb) per kilowatt, or 7 kg (15.43 lb) per horsepower – another record-breaking value.